Three lost polar bears search for a new home in this timely book from award-winning French illustrator Barroux. Life is quiet and peaceful on the ice for three polar bears, until, "CRACK!" The ice breaks, and they drift away. The sea is dangerous, so they need to search for a new home. Then, the polar bears see it . . . Land! They're saved! But the cows there think they are too furry, bearish, and tall, so they don't let them live there. The panda says there's no room on his island (though there clearly is! ), and the giraffes pretend not to hear. All the while, their ice floe is getting smaller and smaller until they come to an empty island. A new home, all to themselves! That is, until three lost monkeys who are looking for a new home come along. The bears think about it, and say that they are welcome! 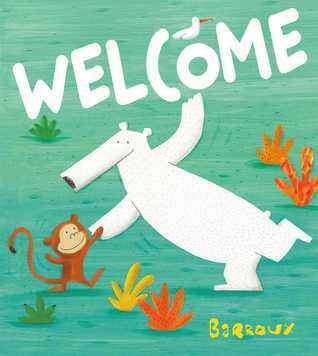 Barroux's beautiful story was inspired by the ongoing Syrian refugee crisis and promotes inclusiveness and welcomeness for children! Barroux studied photography, art, sculpture, and architecture in France at the famous École Estienne and École Boule. He went on to work as an art director in Paris and Montreal. While in Montreal, Barroux began illustrating by creating linocut images, and he is now well known for his children’s book illustrations, including Starfish, Where Are You? (Summer 2016). This book had a great message about kindness and treating others well. I loved the colorful pictures of all the animals and am so happy that Little Bee Books sent it to me. Sorry for no video but I'm taking a break from doing those right now. This book shows a very true prediction of how we treat others in our world. And it was a great lesson to learn. I think this one would work great in schools!